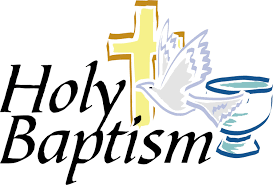 When: Baptisms (See Bulletin) are held on any Sunday at Noon, or during Mass. Completion of a Pre-Baptism Preparation Class is required prior to any scheduling of a Baptism. This program meets bi-monthly (usually on the second Sunday). Who: Parents are required to attend. Godparents are highly encouraged to attend this class along with the parents. When a child or an adult is to be baptized, he or she must have at least one godparent or sponsor (the terms are interchangeable). It is customary for children to have two godparents. When there are two, one must be male and the other female. Godparents must meet all of the following criteria, which are established by universal Church law and which do not vary from place to place.